The first step toward building customer loyalty is to find out what your customers are thinking. In-store consumer satisfaction survey cards and online survey forms are a good start. They’ll give the customers who are actively looking for a way to give you feedback a chance to speak to you directly. But they’re only a start! For every customer who takes the time to fill out a card or an online survey, there may be dozens more who have something to say, but aren’t going to go out of their way to say it – or who are too unhappy to even fill out a form. And more often than not, those are the customers who you need to reach. So what should you do? Actively survey your customers. Telephone surveys for customer satisfaction can give you a clear and accurate picture of how your customers really feel – and they are very good at identifying hidden customer-service problems. You can do your own surveys, if you have the time, the experience, and the staff to spare, but far more often than not, a good professional survey services (such as Compechek) will give you the most accurate and useful results. A good customer satisfaction survey will be based on a random sample of your customers (to catch the ones who have something to say, but aren’t talking), and will include a good selection of well-organized, unbiased questions which cover all key areas of concern. It will also include opportunities for customers to make in-depth comments on issues that concern them – an area where trained, professional survey-takers may be indispensable. A customer satisfaction survey isn’t just information-gathering or statistics (although those can be very important). It’s also a launching-point for customer response. 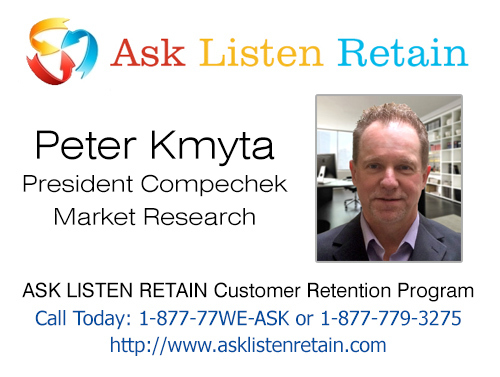 The ASK-LISTEN-RETAIN system, for example, automatically identifies each customer’s areas of concern, and pinpoints potential problems at the individual customer level, alerting you so that you can contact the customer and resolve the problem quickly. This allows you to turn alienated, unhappy customers — whose negative word-of-mouth can drag your business down – into loyal allies, whose positive word-of-mouth can be far more cost-effective than any kind of advertising. And with the kind of comprehensive analysis of survey data which a professional survey company can provide, you can identify and solve problems within your company (such as unresponsive managers, or departments with less-than-satisfactory customer service), track the time and quality of response, and measure changes in customer loyalty – putting you far ahead of the pack in the customer retention and loyalty race.